Do you have a mission statement? Are you employing tactical marketing? 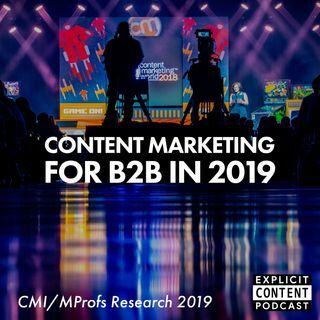 This week on Explicit Content your hosts Pamela Muldoon and Jeff Julian discuss the CMI annual Content Marketing Research Report and its applications in growing your business. An organization’s content mission statement should be a living document that outlines overall strategy, but allows for agility in customer satisfaction and retention. One thing that is always constant in our industry is change. Integration between ... See More strategy, development, and sales is becoming more important in today’s dynamic landscape. Vanity content may be satisfying creatively, but will it reach your targets, and if it does: will it land effectively? The metrics we receive from various platforms can be misleading; using them in conjunction with content audits is an established way to ensure satisfaction. The alignment of strategy and development can be a razor’s edge to walk, but it is critical to delivering a quality product while flowing money to the bottom line. Good research begets good content. Understanding your customers, and their customers, is key. Building a well-researched persona for your client will result in a much higher return on investment, and retention. Let's discuss bringing it back to the basics with audience driven tactical marketing.